It doesn’t get much more intense than this. 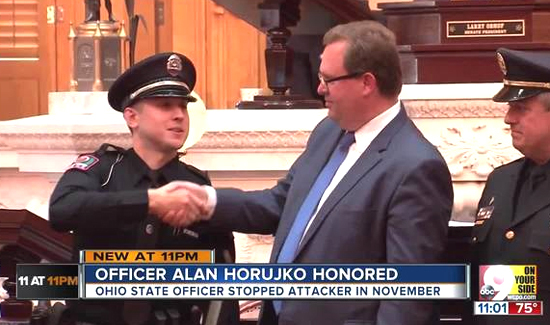 Ohio State University police officer Alan Horujko had volunteered to help out local firefighters that were evacuating a building due to a gas leak. It was the first day of classes after Thanksgiving and the campus was crowded. Out of nowhere, a car barrels into a crowd and 18-year-old Abdul Razak Ali Artan gets out of the vehicle with a large knife and starts swinging wildly at anyone he can get near. Horujko says it was his training that kept him focused and allowed him to safely stop the threat. The officer recently sat down for an interview and it’s the kind of thing other cops can learn a lot from. Click here to here the tale in Horujko’s own words.